The engineless train broke down twice on Saturday morning after Prime Minister Modi flagged it off. New Delhi: Vande Bharat Express, formerly known as Train 18, was halted around 5:30 am at Bahraich, 15 kilometres from Tundla in Uttar Pradesh, about 200 km from the capital at around 6 a.m. It resumed its journey after almost two hours at around 8.15 am before coming to a halt again at 8:55 am. After necessary repairs, it resumed its journey toward Delhi. Prior to it experiencing the technical snag, four coaches of the train experienced an electrical outage and the breaks were also jammed due to engine failure. The train is Prime Minister Narendra Modi’s pet project, and ironically on its first ever journey, it was stopped in the stray cattle menace that is taking alarming proportions in UP. The officials maintained that it was a case of "skidding wheels" due to a cattle run over by the train. This was not a commercial run of the train, which is expected to start its commercial run tomorrow. Many on the train also reported a foul smell and mild smoke which was due to an internal system failure, according to reports. Due to a deposit in the wheels, the braking system was jammed. Calling it a "mechanical fault in the braking system" the staff said the train made thumping noises when the speed was increased. According to the train staff, the fault had led to the control failures of the air-conditioners. 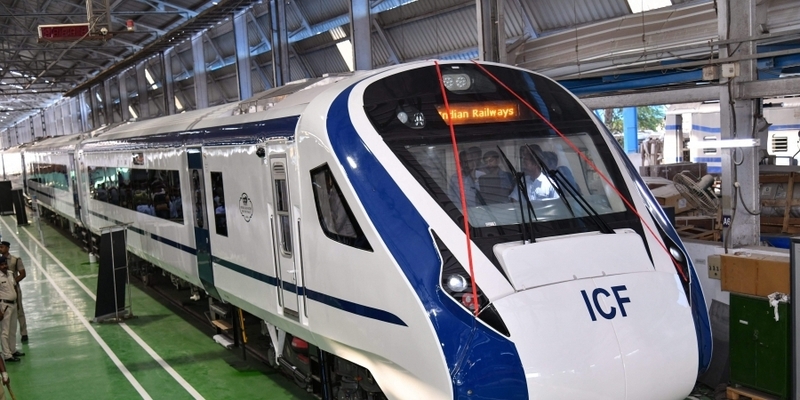 Incidentally, Railway Minister Piyush Goyal on Friday had said he was "encouraged by the positive feedback" received on the run of Vande Bharat Express and had decided to place an order for hundred more such trains to cover all routes for shorter distances. Speaking to Newsclick, Shiv Gopal Mishra, General Secretary, All India Railwaymen’s Federation, said, “It is important to understand that we may or may not be ready for these developments, our technology still needs stabilisation and the troubleshooting processes need fixing.” Many on the ground believe that instead of focusing on extravagant projects, the government needs to prioritise fixing existing lacunae. The development comes in the wake of opposition from Railway employees to the bullet train project, against which the workers will be staging multiple protests in March, many have asserted that there are long-standing issues in the Railways, such as that of minimum wage for skilled workers to be increased to Rs. 22,000 per month and the 2.50 lakh vacant posts to be filled.